French manufacturer Stelia Aerospace has used additive manufacturing to develop an aircraft fuselage panel with integrated stiffening structures for self-reinforcement. In what it claims is a world first, the company used a process known as WAAM – Wire Arc Additive Manufacturing – to deposit the stiffening aluminium wire to the inner surface of the 1x1m2 panel. Currently, the web-like stiffening structures inside fuselages are screwed or welded into place by hand. According to Stelia, the new technique could present an opportunity to rethink and redesign fuselages, removed from the constraints of having to attach the reinforcing lattices at a later stage. 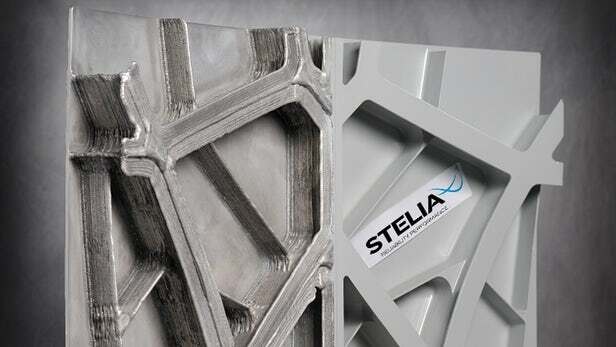 “With this 3D additive manufacturing demonstrator, Stelia Aerospace aims to provide its customers with innovative designs on very large structural parts derived from new calculation methods,” said Cédric Gautier, CEO of Stelia Aerospace. Referred to by Stelia as DEFACTO (DEveloppement de la Fabrication Additive pour Composant TOpologique), the two and a half year project was co-funded by the DGAC (French Directorate General for Civil Aviation), as well as partners Constellium and Ecole Centrale de Nantes. The research is part of a broader investigation into additive manufacturing, which Stelia hopes will result in new designs, weight gains, better integration of functions, lower ecological impact through the use of less materials, and reduced manufacturing costs. Stelia – which employs nearly 7,000 people around the world – designs and manufactures the front fuselage sections for the entire Airbus family, as well as central fuselages for Bombardier’s Global 7000, and composite parts for Boeing, Bombardier, Embraer and Northrop-Grumman. What is technology’s role in sustainable development? This looks so similar to the braided structure I have commented upon before that I am certain there is some synergy here. designs, weight gains, better integration of functions, lower ecological impact through the use of less materials, and reduced manufacturing costs. Actually, don’t they mean weight loss? Sometimes (actually all too often) publicists excel in producing texts so rich that they end up contradicting themselves!